Farmers Roast Chicken With Creamed Chantenay- There’s nothing better than a delicious roast chicken dinner, its I real crowd pleaser. 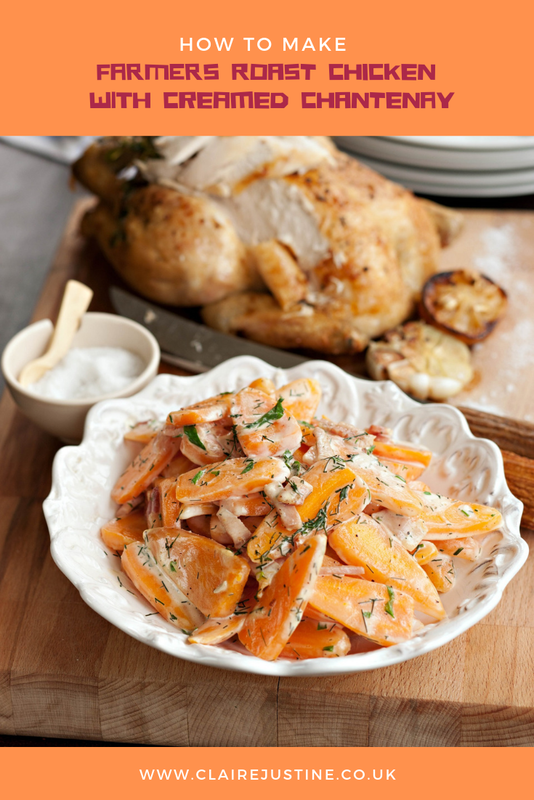 Served with creamy, lemony Chantenay carrots what could be better. Discard chicken giblets. Remove any excess fat from around the cavity of the chicken, and discard. In a medium mixing bowl mix together the butter, lemon zest, finely chopped thyme and rosemary, sea salt and black pepper. Rub the chicken inside and out with the butter and some under the breast skin. Stuff the cavity of the chicken with the lemon halves and the quartered onion and the remaining sprigs of the thyme and rosemary, along with the head of garlic. Place the chicken in a roasting tin and pour over the wine. Roast, basting with pan juices every 20 minutes, for 1.5 hours or until golden brown and cooked through. When the chicken is cooked, remove the chicken from the baking tin and leave it to rest on a large plate or platter, covered with aluminium foil, for at least 10 minutes before carving. Sprinkle with sea salt, to taste. About 15 minutes before you take the chicken out of the oven cut the carrots into slices and put them into a saucepan. Add the stock and bring to the boil, then cook until the carrots are just tender, and the stock has reduced. Heat a frying pan over a medium heat and sauté the bacon lardons in their own fat until golden and coloured. Remove from the heat and add the cream, lemon juice, parsley and dill. Stir the cream sauce in with the cooked carrots and season to taste with salt and black pepper. 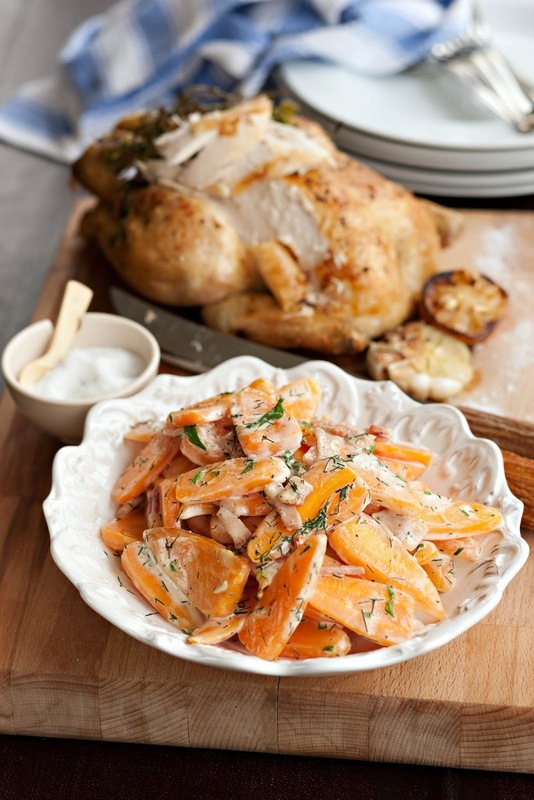 Carve the roast chicken and serve with the creamy carrots.